Even a baby king cobra has the hunting skills of an adult. 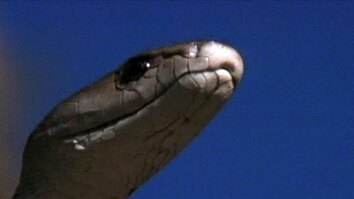 In the forests of southern India, a week-old king cobra must find his first meal. Despite being a literal “babe in the woods,” this little guy already possesses all the skills he’ll ever need to survive in the forest. If he makes it to adulthood, he could grow as long as 18 feet, about 15 times his current length. Using his keen eyesight and powerful sense of smell, the little King spots his prey, a small olive water snake. He locks onto his target, and moves into striking position. Though only a week old, already his hunting skills are perfect. He pursues his intended victim with a singleness of purpose, delivering a powerful neurotoxic venom with one swift strike. 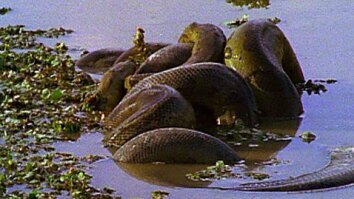 Other snakes are a favorite food of the King Cobra. They dine on them almost exclusively. 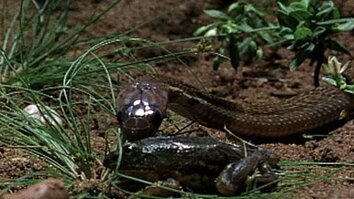 When the little king is full-grown, he’ll have enough venom in just one bite to kill up to 20 people, but for now, he has just enough for the little water snake.